Dialogue as a means of translating and relaying our internal and external worlds prescribes importance to language as a form of communication. Letters are modules of language as independent units that unite to construct meaning. The chairs function as convenient places to sit but extend their purpose as conduits of meaning and methods of communication. Each chair carries the potential to become the entire alphabet, and with multiple chairs, vocabulary forms. 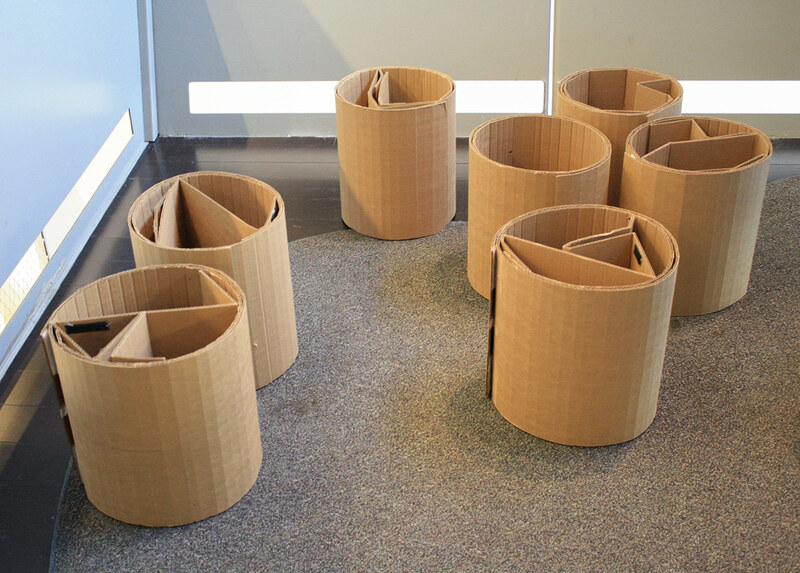 The stools, while disconnected from each other, create one chair as the letters are connected by conceptual joinery to create dialogue through words. Choice becomes a centrality; the chairs can be rearranged into any word and any letter, opening the realm of communication and maximizing conversation. The chair’s ability to collapse and become mobile allows for it to roll into a small transportable unit, demonstrating language's flexibility, its ability to spread and be silenced. The work on the wall highlights the typeface created by the chair, revealing the 26 letters of the English alphabet.